It slams the Interior Ministry for mismanagement of available land for building homes, including for lacking data on the land, such that no effort was made to prepare land for development. The report criticized the Israel Lands Authority for not developing any broad multi-year strategic plan, for setting unrealistic shorter-term targets for developing land, and for failing to tailor its local planning efforts to local housing needs. The report noted that only four out of 71 local municipal authorities have updated development plans. There was heavy criticism for the red tape of local planning authorities, which held up approvals for housing units for unreasonable amounts of time, leaving 50,000 units in the pipeline that could have moved forward. Some approvals were drawn out for between 5.5 and 7 years, with it sometimes taking 12 years from the time a development proposal was filed until people could move in. Many of the plans in Israel date from the British Palestinian mandate, almost as bad as Libya where the plans date back to Mussolini. There is no real planning consultancy market in Israel and the real regional expertise lies in neighboring Arab countries in forms like my own which of course wont work in Israel. Most of the land allocations that do occur are purely political decisions made on sectarian grounds. The flagship of the March 2014 Budget was the Pensions Reforms crafted by Liberal Pensions Minister Steve Webb and enthusiastically backed by the Chancellor. The theory being that pensioners didn’t need to be nannied and could take what risks they wanted. It was likley that the Chancellor was not unadverse to a dramatically increased demand for buy to let. After all he had widely been reported at Cabinet as saying a pre-election house price boom would be welcomed. If house prices now lagging he might reason, in his own terms, this is the boost the market needs. The impact will be not just on the annuities industry but on the financial assets they previously bought to fund the steady and risk free income stream needed to fund them – principally gilts. Now the evidence is coming in as to what that buy to let boost might be. It is not good news to anyone concerned about financial stability. One in three people heading for retirement are considering purchasing a buy-to-let property, according to a recent survey by Platinum Property Partners. Now a property solicitor has predicted a post-pension reform “feelgood fortnight”, as older savers rush to become amateur landlords. John Nattrass of law firm McHale and Co said property prices, interest rates and new pension drawdown rules all point to significantly increased buy-to-let purchases in the spring. Solicitor Tim Wixted, managing partner at NeglectAssist, has warned it could all end in tears. Its research has shown that 80,000 older people will use their new-found freedoms to invest in buy-to-let every year. But Wixted said pensions reform is a mis-selling disaster in the making. “If the pension reform unleashes this pent-up appetite for being a buy-to-let landlord, we will likely see a boom and ultimately bust. “With over 80,000 new retirees looking to invest in buy-to-let each year each year, inexperienced landlords will encounter low returns and unexpected problems. Rising housing capital values from increased buy to let demand is likley to be taken by retirees as a false signal of increased fundamentals, whilst if the rise housing investment will eventually feed through into greater completions depressing rental yields leading to an eventual popping of a real estate bubble, though this may take 3-4 years. At precisely the time when a falling demand for gilts will require either increased yields or a new batch of QE to mop up gilts at low interest – which will in turn fund an asset boom. I suspect though that headlines around Easter of ‘feelgood fortnight’ will prompt many warnings in the media that this is an artificial pre-election house price boom and dire warnings amongst financial commentators not to bet their entire pensions on high risk investments. This could produce a political backlash and a swift market correction. Nothing pops a bubble quicker that fear of losing your nestegg. So watch this space for TV pictures of people in their early 60s queuing up outside estate agents waving cheques. There was a reason why pensioners had to buy annuities, to ensure stability and ensure pensioners had a steady and safe income that would otherwise have to be funded from general taxation. The cost of a grey boom and bust wont just be to house prices and banks this time but to state finances of a bail out to greedy and foolish buy to let baby boomers, now left penniless after having to make distress sales on their property purchases. Plan making has significantly improved under this Government. As recent plan-making progress is very positive, the Government has no immediate plans to introduce a statutory requirement to get Local Plans in place. However, the Government will keep under review whether it may be necessary to introduce further requirements or sanctions in respect of plan-making in the future should this situation change. Thanks to this Government’s reforms, we have recently seen a substantial uplift in planmaking. When we know ministers dont even believe that and are seriously worried. The only thing we have seen an uplift in since the NPPF is plans failing to pass muster and bcome adopted, Indeed plan progress has not been as slow in the last 20 years. By ‘should the situation change; it means after the election when a new SoS cleans up Eric’s mess. It then goes on to reject the recommendations concerning changes to the NPPF itself, almost every one. Planning guidance further refers to the need to keep plans proportionate. However, the Government agrees that this could be stated more clearly and will consider a clarification to the Framework/Planning guidance. Perhaps this is the long awaited ban on policies that offend ministers prejudices – like as the Policy Exchange ban on Cycle parking, much like Peter Bottomlys famous checklist of conservative dog whistle issues on what the GLDP mustn’t contain many years ago and as hinted at in a letter from Boris to Eric last month. It doesnt even accept obvious and silly omissions from the NPPF like requiring plans be kept up to date. The Government agrees that plans should be regularly reviewed to ensure that they are kept current and provide a robust framework for decision-taking. The Framework does this by requiring plans to be based on appropriate and up-to-date evidence. Planning guidance sets out that most plans are likely to require updating in whole or part every five years. The Government will be writing to those local authorities who adopted their Local Plans before 2010 to remind them of the need to review their plans or to continue with their work in this respect. Of course the NPPF only requires local plans as submitted to be based on up to date evidence and without a statutory requirement to keep plans yup to date is toothless. One para paints a different picture on interpretation of the NPPF which is effectively an amendment. In the Government’s view it is already clear that all sites would count against the five year supply of housing land unless it is very clear that these sites will not be delivered. Of course if this reversal of proof was already clear they wouldn’t be saying it. the Government is also clear that the responsibility for a review of the Green Belt rests with the local planning authority and must be conducted through the local plan process of consultation and examination. The rationale for this approach is to ensure the Green Belt is considered in the round of all the other planning issues the Council is addressing in its Local Plan and on an authority-wide, and indeed a cross-authority basis where appropriate. Again if it was already clear they wouldnt need to say it. The wording of the NPPF about mutually reinforcing and being pursued together etc. does not imply they are given equal weight. This statement is effectively an amendment. The response on the Duty to Cooperate expressly says the government will not be issuing new guidance on what constitutes cooperation. The reason for this is the government does not want to spell out that meeting the duty requires strategic planning having just abolished it, it would make them look foolish. So LPAs have to figure it out for themselves (after years of unnecessary conflict and delay). The Government does not, however, feel that top-down direction requiring local authorities to join together in plan-making is appropriate given local areas should rightfully arrive at whatever is the most appropriate approach to plan-making locally. The Government will test further with applicants, local authorities and representative bodies whether there is an appetite for joint endorsement of the use of particular models or principles of viability assessment as best practice. It does not believe that imposition by Government of a single viability model for all purposes would be appropriate or welcomed and that it would conflict with commercial practice. Planning guidance recommends use of a standard methodology to assessing housing need based on a simple core method using secondary data sources. This approach avoids the need for complicated bespoke arrangements and ensures that assessment findings are transparently prepared. The problem being the simple core methodology is too simple hence the make it up as go along and you read each precedent and caselaw approach which leads inevitably to complicated bespoke arrangements. The Government is open to considering whether modest improvements to the examination procedure could increase certainty for local authorities. We are discussing with the District Councils Network and Planning Officers Society their proposals for a split examination process to see whether there would be merit in taking this further. However, the Government does not support fundamental changes to the plan making or examination process which could risk delay. The legislation is clear that a neighbourhood plan is considered against the development plan, not an emerging Local Plan. Yet the Government fully understands the concern of those submitting evidence to the Committee that, in order to retain the confidence of communities, a neighbourhood plan must be an effective tool to shape development. Planning guidance draws attention to the importance of minimising any conflicts between policies in the neighbourhood plan and those in an emerging Local Plan. Neighbourhood plans, like Local Plans, should be designed with sufficient flexibility to respond to changed circumstances if they are to shape development not just for the immediate future but for many years ahead. Planning found the solution to this decades ago with the ‘permitted assumption’ test that local plans could be deemed to conform to an emerging and not an existing adopted structure plan. This reply hints at the fact that the localism act is much more badly worded that the 1990 act and this test, introduced through secondary legislation, is not possible. So amend the legislation. It reaffirms the Chancellors LDO led approach to brownfield even though the Mayor of London, who served as the model, has rightly already dropped the idea as unsuitable. The Government expects to see local development orders granting permission for housing in place on more than 90 per cent of suitable brownfield land by 2020 and believe this could provide planning permissions for up to 200,000 new homes. the Government does not agree that without an up-to-date Local Plan local authorities surrender their ability to influence the future development of their areas. The Framework is clear that it is the purpose of planning to enable only truly sustainable development, not development at any cost. Again it is not clear and the NPPF does not say at any point. This is a new phrase introduced in recent months to see a subtle shift away from the full weight of para 14. It is also a subtle shift away from local plan primacy. As Brandon says just rely ion the NPPF (as recently reintepreted) and refuse and this side of the election we will probably support you on appeal, especially if you have pulled the neighborhood plan bait and switch. On Green Belt reviews it repeats the position that this is entirely a matter for LPAs. The Government welcomes the Committee’s support for neighbourhood planning and its recognition of the tremendous achievements of the 52 communities that have said ‘yes’ to housing and other development delivered through a neighbourhood plan or a neighbourhood development order. Of course in England there are 9948 or so other communities without one which routinely say no to housing. Localism has had no impact on delivery of housing, not a pinprick. This is not being cynical , neighborhood planning is a good thing but it does nothing on a national scale to improve delivery the real problem, which was the utopian and disproved hope of Greg Clark. So to summarise. The DCLG select committee somewhat unrealistically believed that the rate of local plan production could be increased 10 fold and this would solve everything. The DCLG don’t believe this they are dis paring of the problem, everyone knows this, but they say the opposite in public as this would be to admit the main premise the NPPF was based on, that it would act as a stick to incentivize local plan production, has failed nd Eric would look like a fool. Well we all know he looks like a fool. His entire package of reforms has failed as we now get less land allocated and housing in sustainable locations replaced by scattered unsustainable development in villages with neighbourhood pans becoming a tool for undershooting OAN rather than meeting it. Gladman are to lawyers what Jimmy White is to bookmakers, a pension. (1) That the Defendant, and the Inspector who conducted the Examination in Public …failed to have regard to the requirements of national guidance in relation to the objective assessment of full housing needs in the Borough (and in the housing market area). (2) That the Defendant and the Inspector failed to consider the requirement in national guidance that any assessment of the market demand for housing should be informed by market signals/market indicators, and thus failed lawfully to define the market demand element of objectively assessed needs. The first challenge was that the inspector failed to require the now well known ‘two step’ assessment set by the Gallagher case. The court he’d he applied this without having expressly referred to it. The much more interesting challenge was on the second point. The inspector however invited comments on this issue. Galdman argued more weight should have been given to this point, but that was amatter fro the inspector. I’m surprised this long shot went to court. In an article for the ConservativeHome website published in December last year, planning minister Brandon Lewis highlighted that “four out of five councils have published a local plan, compared to less than a third when we came to power” in 2010. To those with little understanding of the plan production process, these figures might sound impressive. But planning practitioners know that the number of plans published is not a particularly useful yardstick because publication comes very early in the plan-making process. An analysis by Planning this week paints a different picture to the minister’s ConservativeHome article (see Trackers). It shows that fewer than a quarter of councils have in place a local plan that was adopted since the National Planning Policy Framework (NPPF) was introduced – authorities whose plans are older than this cannot be confident that the documents comply with the framework – and that while the pace of local plan adoption increased last year, still only 33 plans were adopted in 2014. There are a number of reasons for slow progress in local plan adoption, highlighted in a report published by the Communities and Local Government select committee before Christmas. These include resource constraints, a lack of political will, and the length of local plan documents themselves. Another key factor cited for holding up progress, identified by the select committee, and underscored by a planning inspector’s findings last week, is the Localism Act 2011’s duty to cooperate, which requires local planning authorities to engage with neighbouring councils when addressing cross-boundary development issues, such as housing…. It seems clear that if ministers are frustrated by the progress of local plan production, here is an area where government action could help. One suggestion is that councils could be given incentives to cooperate, perhaps with certain grants linked to cooperation. But a quicker fix would be for the government to take a look again at its guidance, so that local authorities are left in no doubt as to what they need to do to meet the duty. The only way to meet the duty is to do larger than local planning, joint strategic plans in many cases. This is not a quick fix and ideologically Pickles wont do it. He should turn the ‘big gun’ he threatens to use on anyone who mentions strategic planning onto the cause of the problem. As everyone has been saying, interpret with care because of concealed household and supressed household formation during a period of recession, only 1,000 pa less than 2011 based interim projections, so for those about to publish their SHMAs, dont panic. The number of households in England is projected to increase from 22.3 million in 2012 to 27.5 million in 2037. Annual average household growth is projected as 210,000 per year between 2012 and 2037. Average household size is projected to fall from 2.36 in 2012 to 2.21 in 2037. Over the period from 2012 to 2022, annual average household growth is projected as 220,000 per year, comparable with 2011-based Interim Household Projections figure of 221,000 from 2011 to 2021. The 2012-based Household Projections have a very similar rate of household growth 2011-based Interim projections of the comparable period from 2012 to 2022. For this period, the 2012-based projection show an annual average of 220.0 thousand per year compared with 220.5 thousand per year between 2011 and 2021 in the previous Interim Projections. Comparing the projected change in household population, the 2012-based projections show a growth of 7 per cent between 2012 and 2022. This compares with 9 per cent between 2011 and 2021 in the previous Interim Projections. The 2012-based household projections show has higher rate of household growth than the Interim Projections despites a slower increase in household population. The lower population growth has been offset by higher projected household formation. They perhaps could more clearly have put it the other way round, the lower population growth offsets a slightly higher rate of projected household formation, producing a slighting lower number of projected households. I was writing a piece on the history of the politics of tall buildings in London when Phillip Davie’s name popped up. He – Director of Planning at EH london for 30 years – of course was called ‘mad’ by Ken Livingstone for opposing certain tall buildings. I recalled how quite a few women in planning in London, admittedly of a certain age, told me they found him their secret fantasy figure. What did he have, certainly he had aged well, his raffish mustache as a young man, his posh denouement, his historian background and knowledge of the raj, his silver fox flick. Who knows men can only guess. How the brownfield initiative should be done, a great article on City Lab. For more than three decades, the vacant Sheraton Hotel loomed over City Hall in Gary, Indiana, a billboard for the city’s descent from Steel City glory into postindustrial blight. Once the city’s tallest building, it was hailed as “the gateway to the city’s future” by former Mayor Richard Hatcher upon its opening in 1971. It went dark just 14 years later. Entering or passing by Gary on the highway, visitors could see straight through the gutted building, its skeleton a rebuke to the neoclassical dome of City Hall right next door. Until last October, that is, when current Mayor Karen Freeman-Wilson delivered on a campaign promise to tear it down. Freeman-Wilson, a Gary native and Harvard-educated lawyer, becameIndiana’s first black, female mayor when she took office in 2012. Critics dismissed the move, which received federal and state funds as well as city financing, as a mere public relations stunt. But demolishing the Sheraton could also be viewed as the opening salvo in Freeman-Wilson’s larger war on blight—a campaign she says also addresses crime, economic development and, crucially, the city’s image of itself. Freeman-Wilson “could not contain [her] excitement” last year when Gary got $6.6 million from the state’s Hardest Hit program to knock down and fix up abandoned homes. But with an estimated one in five of Gary’s buildings vacant, and more than one third of its properties blighted, that windfall falls far short. 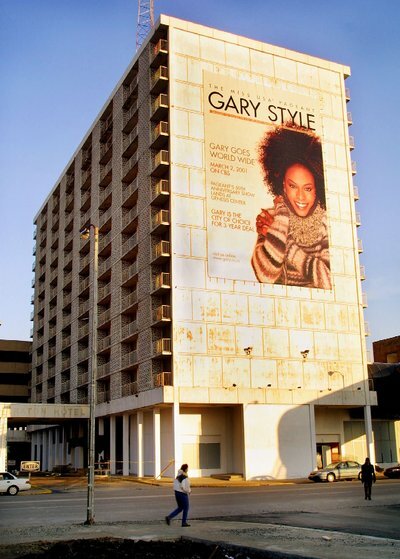 Named for a founder of United States Steel Corp., Gary is what could be called a legacy city. The former company town flourished during America’s post-war heyday, crashing spectacularly with the Indiana steel industry. It has lost more than half of its population since its peak of about 178,000 in 1960. Today it’s working to diversify its economy, Freeman-Wilson says, and struggling to provide for the citizens who still live there. Last year the Obama administration added Gary to its Strong Cities, Strong Communities program, helping it leverage federal funds and improve its pitch to foundations. The Hardest Hit funds it snagged last year—almost half of Indiana’s $15 million pot for blight reduction—could eventually demolish as many as 1,000 blighted structures. Compare that to the 30-45 properties the city’s demolition coordinator, Cedric Kuykendall, had estimated he could knock down with his existing budget of just $300,000 from the U.S. Department of Housing and Urban Development’s Community Development Block Grant program. Van Dyk says by the fall, the city hopes to “get [its] data house in order,” synchronizing the new parcel-level database with information it already has at various city agencies, like the police and fire departments, and with development indicators such as business licenses and property tax payments. It will also overlay data from outside bodies like the U.S. National Park Service, which maintains the Indiana Dunes National Lakeshore nearby. That includes recycling building materials. Gary is working with the Chicago nonprofit Delta Institute, a sustainability consultant, to divert some of the demolition debris from area landfills—an environmental benefit, but also a possible source of revenue for local contractors and craftsmen. The city’s still deciding how it will dole out the demolition work, but at least a portion is expected to go to local businesses. The Delta Institute’s Eve Pytel is managing their work with Gary. She says they hope to train those doing the demolition how to “deconstruct” buildings and sift for “hidden treasures” like old-growth lumber and custom midcentury doorknobs. 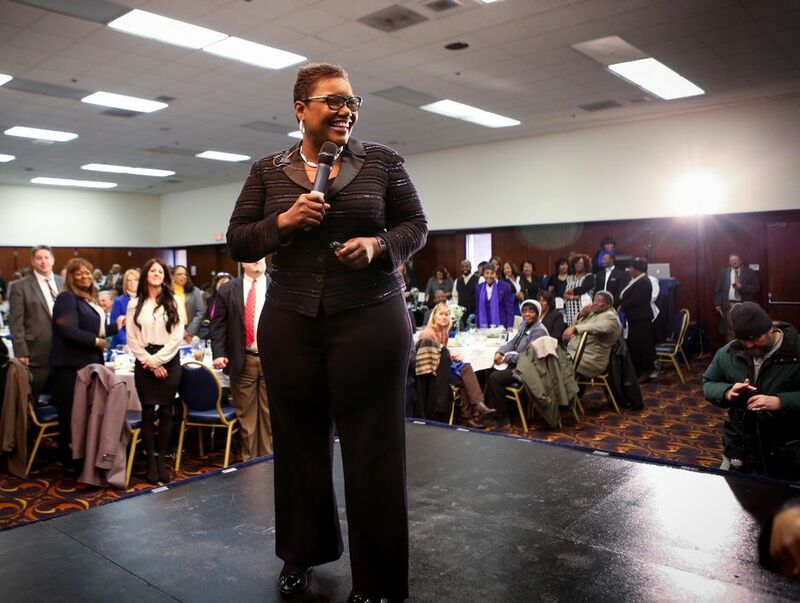 Freeman-Wilson’s ability to bring in far-flung consultants and federal funds will play a key role in her bid for reelection later this year. Critics say she’s focused on blight reduction at the expense of police and firefighters, who haven’t had a raise since 2007. Freeman-Wilson counters that blight reduction is part of an overall strategy for breaking the cycle of disinvestment and depopulation in Gary. Gary officials now have a roadmap as they make difficult decisions: Can the city shed some of its 52 square miles? 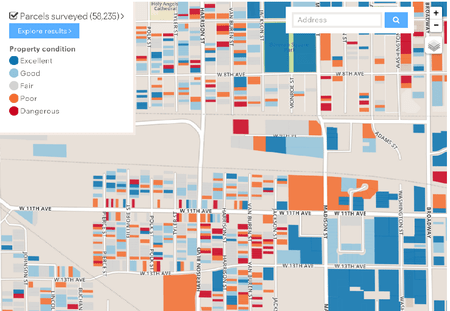 Which neighborhoods need blight reduction the most? What’s the best use for vacant land? But van Dyk says the citizens of Gary have a knowledge not found in any data set, and that has to be part of the solution, too.